I've tried a couple of setups using nLite, it's truly amazing what this program can do. Now, I don't like Windows Media Player 9/10/11, so I removed it in the nLite wizard. I also removed the possibility to install later versions of Windows Media Player - the option which appears very late in the wizard, I think it's right before you make the ISO. Though, I kept the 6.4 version (marked red by nLite), because I've heard that you need it for playing Windows Media files. Installing my "diet XP" (ISO files was only 249 MB! ), and using Media Player Classic, I've found out that WMV files cannot be rendered. Does anyone know what this problem is related to? As I wrote, I did keep the 6.4 stuff (Windows Media core related, right? ), but not compatibility for installing WMP later. Is this the reason? I suppose the reason cannot be that I removed WMP 9? EDIT: By the way, I'm quite sure that I also removed something like "Media Center". Media Center has nothing to do with it. Are you sure you kept WMP 6.4? Check again. I was under the impression that, if you keep WMP core, nLite at the end does not allow you to disable WMP compatibility - that option is only available when you remove WMP altogether (I think). It is weird that you kept WMP6.4 and yet you cannot play WMV. Can you watch WMV online? If you don’t want WMP, you should remove WMP 6.4/9 but at the end keep WMP compatibility enabled. Then, you can use WMLite (one of the two below) to install Windows Media Runtimes (to play WMV with the player of your choice) and the browser plug-in (to watch WMV online with the browser of your choice). First of all, thanks a lot, WMLite solved my problem! Yes, WMP 6.4 is present in the folder Program Files\Windows Media Player (this is the only file in that folder). Watching any WMV (neither local or streaming) did not work at all before installing WMLite. I had the Windows Meda Firefox plugin but that made no difference. 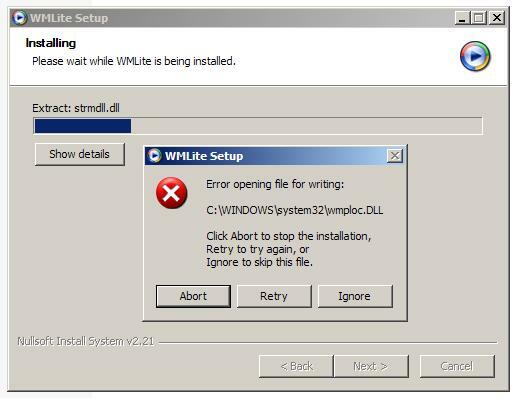 I have no idea why Windows Media did not work even with WMP 6.4 in place, but it doesn't matter much to me since WMLite has solved it. Now there's only one thing that concerns me a little. In a previous attempt of installing an nLite tweaked Windows, I removed just about everything that was related to Windows Media. Still, the folder "windows media player" was created (and impossible to remove) in Program Files. It is not very serious, but I don't like unnecessary folders. But that's another story, maybe a little off topic for this thread. Maybe WMP 6.4 core does not do much without the Win Media Format Runtimes; that would be my guess. PS: And yes, you can keep WMP6.4 core and disable future WMP compatability; I was wrong at the beginning it's only when you keep both WMP6.4/9 that nLite presets that option to enabled. I previously had both WMP 6.4 & 9 removed, but I don't remember if I also removed compatibility in the end. I believe I didn't touch it, which could mean that is was set to "don't keep", since this was the default setting the last time I used nLite (and kept WMP 6.4). Next time I will for sure remove both 6.4, 9, and not keep compatibility. WMLite should restore all media support, right? Though I found a topic here, WMLite doesn't seem to restore WM compatibility for all users who removed both 6.4 and 9. If the folder Windows Media Player still is created when I set nLite to remove both 6.4 and 9, well then there's not much to do. Yes, I tried to delete it manually. Access denied. I've done it before (in non-nLite tweaked installations of Windows), in safe mode, but the folder is automatically created again on next boot up. It even had lower-case letters which is very annoying! So, now I'll try to make another ISO with nLite, there is at least one more thing I'm tempted to remove. No, the deafult is to keep WMP compatability (enabled). You need to remove WMP6.4/9 and keep WMP compatability enabled, in order to be able to install WM Runtimes afterwards (which will allow you to play WMV with the player of your choice without the need for WMP core). Otherwise, you will NOT be able to install the WM Runtimes (the redistributable pack from M$), and you will need to install something like WMlite (= core + runtimes). Plus the browser plug-in. 1) WM Runtimes (installs only if you have WMP compatability enabled), to play WMV in your PC with any player. 2) WMP core (not needed if you just want to play WMV with another player). 3) WM browser plug-in, to watch online WMV (you need WMP core for that). So I guess I've got this right: Now I've made a new ISO, without WMP 9, WMP 6.4 and WM compatibility. Not a trace of WM should be left - but it'll all work if I install WMLite. Then I can play WMV files in any player and get it streaming, online. Excellent! 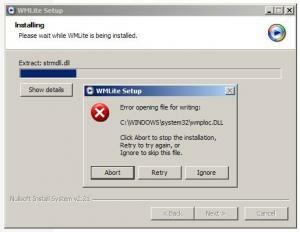 You are right, yes, but once you install WMLite, there will be a lot of WM traces there!!! LOL, I can live with that. By the way, do you have any opinion which of WMLite 2.4.0 and WMLite10 2.1.0.36 that is best? Perhaps no practical difference at all? They seem to be very similar, indeed. OK, I'll stick with it then, since it works here too. Thanks again for your time, now every aspect of the media issues has been (enough) clarified, from my point of view. I'm picking up my old thread again. Maybe this is a little off topic, but regarding Windows Media Lite 2.4.0, I just noticed that the Firefox plugin doesn't work. WML 2.4.0 makes WM work in IE7, though. The embedded Windows Media Player does not appear correctly in FIrefox, and I get a warning message that a plugin has "performed an illegal action". Instead I had to install the separate WMP Firefox plugin that Microsoft distributes, in order to play WM in Firefox. This is not a big deal, it's just that I would have preferred to take advantage of WML's possibility to add the Firefox plugin, rather than installing it separately. 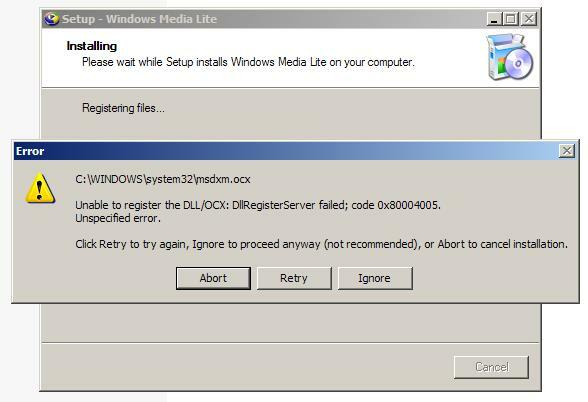 Unable to register the DLL/OCX: DllRegisterServer failed; code 0x80004005. I'm having some similar problem when trying to install Titou2k's pack WMLite10 2.1.0.3, none of the files can be installed. I already searched over MSFN and Internet for an answer without lucky. Anyone can help?